Not ones to be outdone, Dainese has been paying attention to recent trends in the city-commuting moto-world and with their new releases will be offering a couple more options for riders looking for on-bike protection, as well as off-bike style. The Dainese Kateville Women’s Jeans have a signature skinny/slim fit with a stylish, casual look for on or off of the bike. Made out of stone washed stretch denim, these jeans also feature Kevlar panels in the seat and knees for abrasion resistance. The knees have armor pockets to add Dainese’s Pro-Shape knee armor, which is sold separately. For added visibility, you’ll find reflective strips on the rear pockets and the cuffs when rolled up a couple inches. The fit is a slim (bordering on skinny) jean with a low-mid rise at the waist and a slim leg. Priced at $189, these sit in between the Belleville ($229; additional hip armor pockets and Kevlar hip reinforcements) and the Jessville ($179; less Kevlar and no armor pockets). 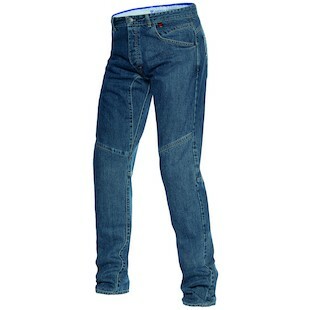 The Dainese Prattville Men’s Jeans are a similar pant to the Kateville as far as price point and features. Constructed of stonewashed denim, they also just have knee pockets with Pro-Shape knee armor sold separately. The fit is similar to a Levi 501, sitting just at the waist with a straight leg. Also offered at $189, these fall in the middle of Dainese’s jean lineup between Bonneville ($229; additional hip armor pockets and Kevlar hip reinforcements) and Sunville ($179; less Kevlar, no armor pockets). Both of these denim/Kevlar choices keep the signature Italian-moto appeal in their construction, style, and functionality. They are sleek options that allow riders to feel adequately protected while cycling through the gears on the roads, and not completely out of place when they park the bike by the curb and stroll along the sidewalks.